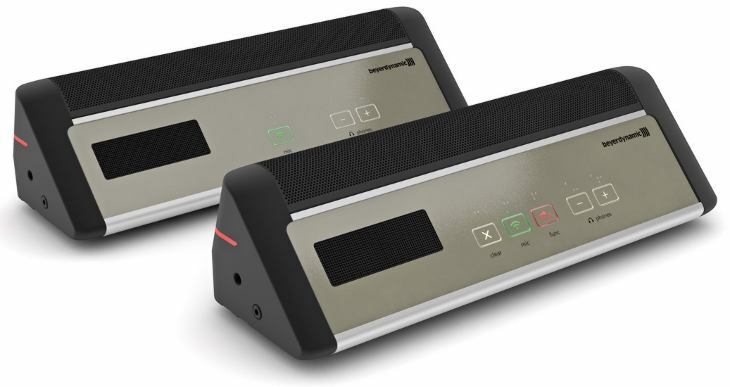 beyerdynamic launched new microphone units with Revoluto technology for its wireless conference system Quinta. Using intelligently connected microphone capsules, the patented Revoluto technology provides a corridor characteristic. This gives the speaker maximum freedom of movement – whether sitting, leaning back, standing or speaking to one side – volume and tone quality are unaffected. Gooseneck microphones are not required any more. The new chairman and delegate microphone units' housings are coated with a very strong, scratch-resistant, premium paint from the automobile industry. Light strips on the side of the casing indicate the ready-to-talk status of the microphone units. The membrane buttons are back-lit with three colours and suitable for use in darkened rooms. The microphone buttons are also labeled in Braille. beyerdynamic has retained its successful charging concept and is offering a modular, mobile charging and transport case for Revoluto. Twelve microphone units can be simultaneously charged in a single charging unit within a maximum of 2.5 hours. They can then simply be taken out and placed on the table ready for use. Along with the wireless conference system Quinta and the universal TG 1000 wireless system, Revoluto will be showcased at InfoComm 2013, Orlando, FL, booth #127 and #742.